Helen May Butler - "The Female Sousa"
Helen May Butler was born in on a farm in Keene, N. H., May 17 1866, when the lifestyle was extremely proper and decorum was the guidepost. Her parents were Lucius M. Butler and Esther L. Butler, the former an engineer on the New York, New Haven and Hartford Railroad, eventually being elevated being elevated to the position of purchaser. He remained to invest and design some of the earliest Pullman cars. 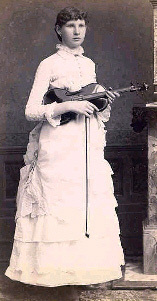 Helen May's penchant for music showed at an early age which prompted her to study the violin under the concertmaster of the Boston Symphony Orchestra. It was from his private collection that she purchased her first "good" violin which was of the same vintage as the Stradivarius. The ambitious young director formed the Talma Ladies Orchestra and she and they were on their way up. The girls performed for many functions in the homes of the socially and financially "great" including the Heinz family. But Helen May was dissatisfied. She wanted to direct an all ladies brass or concert band. That's when her troubles began. She was of the opinion that no one should be excluded from a field if she were talented just because she was a female. But in those days, female band directors, or females in any traditionally male role were unheard of. "There were from 6 to 8 bands and the elimination was down to 2. Mother's band was at one end and a man's band was at the opposite end. The director was the same who had refused to allow her to learn through his band. Mother's band captured top honors and she was presented a gold bar set with a diamond and forom the pin was a golden harp bangle. This proved to be a diamond studded night for Helen May Butler and her band!" Helen May Butler's name appeared with circa band greats, including Creatore and John Phillip Sousa. 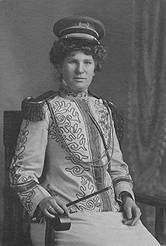 She was often referred to as "The Female Sousa", because they were both very forceful directors. It was during one of Sousa's engagements in Cincinnati that he noted Helen May in the audience and invited her to come to the platform and direct a number." After her first retirement in 1912, she was requested to form a band and play for the season at the lagoon amusement park in Ludlow. Her daughter recalled reminiscences of her mother. "It was fun as well as work. Each day the band departed from Cincinnati in open street cars and all rides were five cents." After her second retirement she was called into action again by Barnum Bailey Circus and described the experience as "Wonderful." Helen May Butler's place in the Smithsonian exhibit includes one of her prized cornets used in her favorite closing "Semper Fidelis" which brought down the house as a silk American flag emerged when the cornet opened. It also includes a beautiful large hat she wore at the World's fair. Helen May Young reports that her mother was very strict with her girls, many of them from wealthy families who permitted their daughters to perform with her because they would be "safe" since she was so highly recommended. Helen May Butler spent 20 of her years in Cincinnati before moving to Kentucky when she lived in Dayton and in Covington many years before she died in 1957. Helen May Young described herself as a "trunk baby", explaining, "I spent the first 3 years of my life going to sleep behind the stage to the music of from 20 to 40 bands. Mother travelled until about a month before Helen May Young was born and started travelling again 6 weeks after Helen May Young was born. Moved to Providence as a small child. Learned music under the tutelage of Bernard Listerman, concertmaster of the Boston Symphony. 1891, Formed the Talma Ladies' Orchestra, part of the a local social club, the Talma Ladies' club. Picked up the cornet and formed a Ladies' brass band. Her first cousin, Harlan Fiske Stone, became chief justice of the US Supreme Court. He credits her for getting a second chance at college after being expelled from Massachusetts Agricultural College. J A Bartlett, composer at a Boston band competition, in 18?? wrote a march "Miss Sousa, Jr." and dedicated it to her. About 1895 - Article in the paper, concert at HMB's parent's home when her uncle, Winthrop Stone, then VP of Purdue University was visiting. HMB and her cousin (not sister as stated in the article) gave a violin concert. (Bessie died in 1897). Article mentions various attendees, mostly relatives. J. Leslie Spahn "discovered" the band, renaming it "Helen May Butler and her Ladies' Military Band" and promoted them as an "Adam-less Garden of Musical Eves." He disguised his gender by signing his name J. Leslie Spahn. Official band of the 1902 Pan American Exposition in Buffalo, NY, where President McKinley was killed. Performed for president Teddy Roosevelt at the White House in 1902. Became one of TR's favorite bands. 1902 - performed at the South Carolina Interstate and West Indian Exposition. 1903 - played in NY City at the 1903 Women's Exposition and won first prize. 1903 - the band played sometimes twice a day, touring the East Coast and the South for a total of thirteen months. C. G. CONN instruments were played on and endorsed by Helen and many of her soloists. As a result, C. G. CONN gave all of the members of the band CONN instruments at their performance at the St. Louis World’s Fair in 1904. Her band performed the same music as Sousa and all of the other bands led by outstanding male bandmasters, all of the pieces being contemporary band classics of the time. The band also performed music by Butler. Published in 1904 by Ingram, and arranged by Richter, her Cosmopolitan America March became so popular that it became the official march of the National Republican Party during Theodore Roosevelt’s Presidential Campaign of 1904. Was a member of the Eastern Star, the Auxiliary of the Independent Order of Odd Fellows, the White Shrine of Jerusalem, and the August Willich Relief Corps. Ran a boarding house 1920-1950 in Covington, KY.
uniforms and other memorabilia was given to the Smithsonian Institution in Washington, D. C.